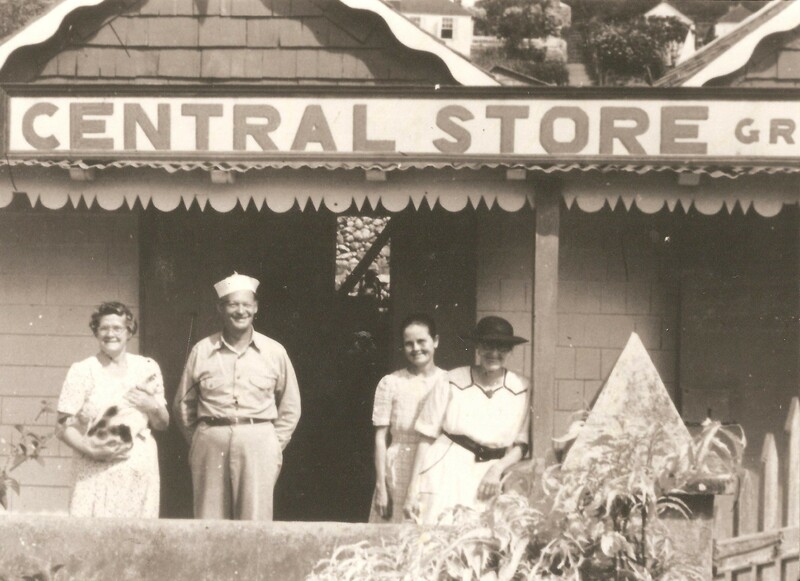 The Central Store. Maude and her husband Carl Hassell, Edith Peterson and Marion Hassell. Capt. Abraham died in 1955 and the Rhode Island newspapers noted his passing with the following headlines: Capt. Abraham Hassell Dies: Was Buyer, Seller of ships. “West Indian Native, He lived Most of Working Years in Providence. Capt. Abraham Hassell, who for more than 25 years found purchasing and refitting vessels in this country for resale in the West Indies and Caribbean area to be highly profitable, died yesterday at Newport Hospital after a long illness. He was in his 89th year. For most of his working life Capt. Hassell lived in Providence, moving to Newport in 1947 to live with a daughter, Mrs. John L. Nolan when he became seriously ill.
Born August 19th, 1866 in Saba, Netherlands West Indies, Capt. Hassell grew up with the sea, worked on it as a boy and continued his love of it when he came to this country as a young man. In 1906 Capt. 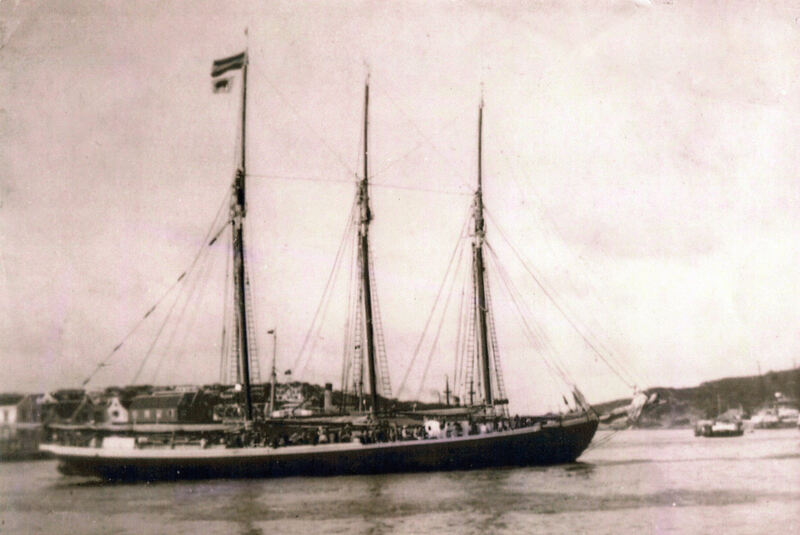 Hassell bought the schooner “Frolic” which had been impounded by the government for illegal use in transporting Chinese from Cuba to this country. He sold the “Frolic” in French Guiana at a handsome profit and started his business. For the next quarter century he bought various schooners, which he had repaired and refitted at Gloucester, Mass., reselling them in Puerto Rico, Barbados and the Virgin Islands. One of the craft he sold was the schooner “Virginia”, built at the Herreshoff shipyard in Bristol. For four years Capt. 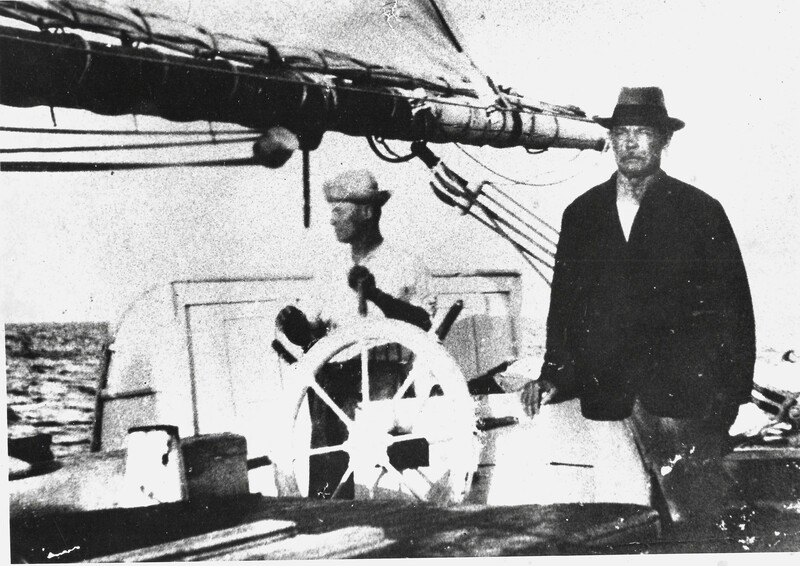 Hassell sailed the three-master schooner. “Frances and Louise,” trading among the Antilles islands. The schooner “Viking” which he described as the prettiest ship he ever owned brought him his only disaster in his career. 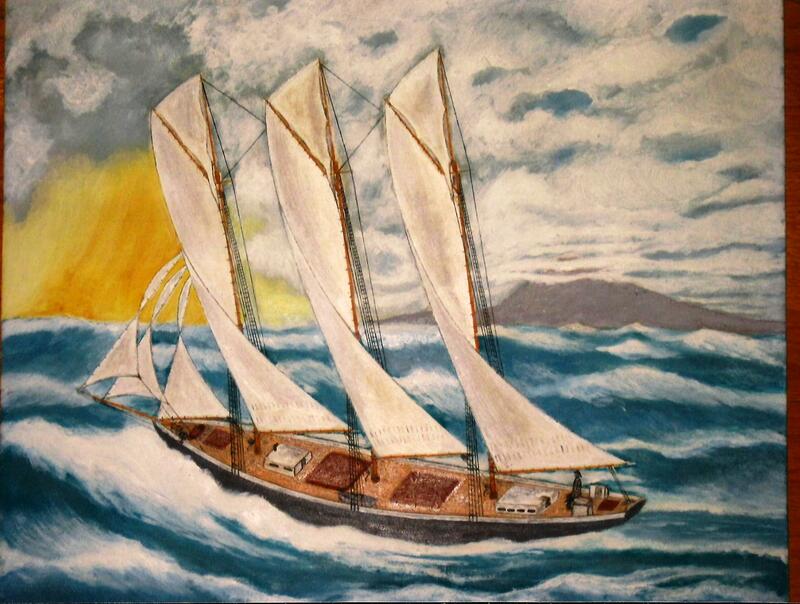 The schooner “Viking” was sent aground in a storm in the Virgin Islands, a total wreck, but with all hands saved. Capt. 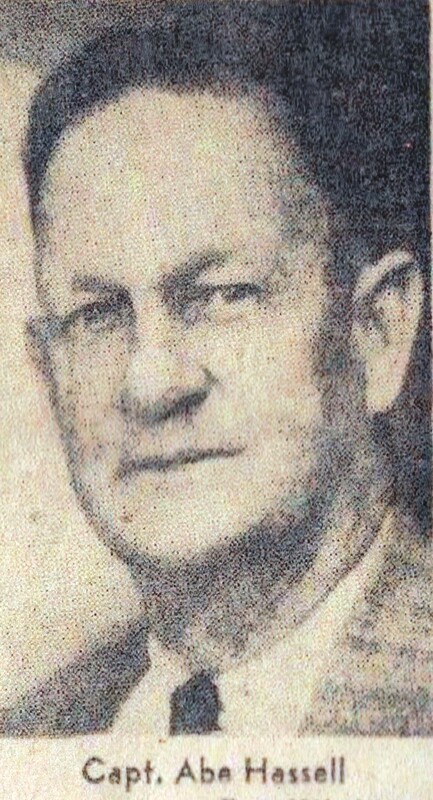 Hassell’s last venture was in 1931, after which he decided to retire. Another newspaper “The Waterfront” carried a similar article about his life and his success at buying and selling schooners. He sold a number of these schooners to captains from Saba as well. The “Viking” was renamed the “Three Sisters”. Mr. Carl once told me that the “Three Sisters” formerly the “Viking” was purchased in 1927. He, his brothers Abraham and Ben were the owners. The schooner was 115 feet long and 192.7 tons. Back then the SHELL and ESSO oil companies were bringing in labourers from all over the West Indies to work in their refineries on Aruba and Curacao. He said that on the very first trip they made enough money to cover the costs of the purchase of the schooner. With Capt. Abraham living in Rhode Island he could buy fishing schooners at a bargain and repair and refit them for carrying cargo and passengers in the West Indies. Typical for boys back then is Mr. Carl’s story which would be repeated in the life of his brothers including Capt. Abraham. “I was just past eleven when I started out, cabin boy on a schooner. There was no money, you know, so that all we lived from was the products of the land; and soon as a boy came up twelve, fourteen years or something like that, why he tries to get away to be able to do something. All the young boys used to go at early ages. The schooner I went on was from Saba. My brothers owned it. The schooner (“Lovely Lila”) came out from America in 1898, and she cruised around from St. Martin, St. Barth’s, all the Windward Islands, and as far as Turks island we used to go. We’d go to Turks Island for straw they make those straw hats from you know. We used to bring that from Turks island and up to St. Martin, and at the later part of the year we made a trip from here to Trinidad and Barbados. Another old sailor Peter Every also talks about going to sea at an early age: “So when I made thirteen I was thinking about going to sea. You see I had two uncles used to sail onto those big American schooners and every couple of months, they’d pass in here, see. Every couple of months they would pass in here and remain here sometimes for two days. And I would see these big heavy, portly-looking fellahs, you know, and I always used to tell my mother that I’d like to go on a vessel to get big and fat like my uncles and they. Yeah, that always attract my nerves, you know, to see these sailors comin’ up in these big vessels, and big and fat and heavy-looking men. My older brother, he went away when he was thirteen years old, went on a sailing schooner when he was thirteen years old. He never came back neither. He sailed around Barbados for must’ve been ten or twelve years or something; and then he shipped onto a schooner, American schooner in Barbados, and then went to the States. And he never came back. Never came back.” By the way Peter also relates how he went to Capt. Abraham’s brother the famous Captain “Ben” to become a cabin boy in the hope of eventually fattening up like his fat uncles whom he admired so much. And although he admired fat people so much his wife was named Lean and lived up to her name as she was always lean. The old property registers on Saba provide many interesting historical facts to back up my research on our former seamen. Nearly every male in property transactions, last wills and testaments and so on is listed as a Master Mariner (captain), mariner, and seaman and so on. Also the selling and buying of vessels was registered in a Notarial deed. For this article here is one of those many transactions: “ On this the twenty fourth day of the month of June in the year one thousand nineteen hundred and twenty six. Before me William Frederick Meinhardt Lampe, Notary Public in the island of Saba residing in said island and in the presence of the herein after mentioned witnesses. Mister Abram Hassell, mariner by vocation, residing in Providence Rhode Island (United States of America) at present temporary staying in this island – appearer on the first part.—and Mister John Clarence Hassell, shopkeeper by vocation residing in this island – appearer on the second part. Both appearers are well known to me Notary. The appearer on the first part Abram Hassell, declares hereby to sell, transfer, make over and deliver in full and free ownership, under warranty according to Law, unto the appearer on the second part John Clarence Hassell who declares to accept in purchase hereby from the appearer on the first part Abram Hassell in full and free ownership and under warranty according to law. All and the whole of the American schooner named “Agnes” of Taunton, Massachusetts (United States of America) and measuring according to a certificate issued at this island on this day: One hundred and sixty seven and sixteen hundredths cubic meters net equal to Fifty nine and seven hundredths tons of 2.8 m3 and such as she now lies at anchor at the Ladder anchorage of this island with her spars, sails, rigging, anchors, chains and boats nothing whatsoever excepted. That amount was a symbolic amount of course being that the schooner was being sold to his brother and I am sure that this must have cost a great deal more. Also in a last will and testament of March 8th, 1927 the same John Clarence Hassell (born November 5th 1874), Abraham’s brother willed two of his schooners to Genevra Holm clerk at the store of his brother William James Benjamin Hassell (Capt. Ben), namely the “Maisie Hassell” 59.4 tons and the “Lena Hassell” of 42 tons both of which schooners were registered on Saba. Since he was a married man I have not heard of any kind of scandal here with him leaving the schooners in his will to Genevra as he died just about four years later. Saba’s history and culture is wet with the waters of the sea . Our people even when they left, whether to Barbados, Bermuda, the Unites States or wherever found occupations linked to the sea. Whether it was a ship chandler in Portland, a purchaser of ships in Providence, captains and owners of a fleet of schooners on Barbados, wherever they went they trusted the sea to provide them with a living. Even in the past fifty years or more many of our immigrants to the USA went into dredging to which they were introduced by Leonidas Johnson of The Bottom. Those who remain on Saba went into the fishing business and when they need a new fishing boat they head up to places like Bar Harbor Maine or Gloucester Massachusetts to buy either new or used fishing boats there. And I might add at far higher prices than Captain Abe used to buy and sell his schooners for back nearly one hundred years ago. And by the way I have his parents and grandparents still with me. As is the case on Saba in many instances they are buried in the front yard of a property I own. And they are well maintained in respect for the fact that the house produced at least four important captains in all and important families like the Goddard family can trace their roots back to that yard!! May Capt. Abe and his family in my yard continue to rest in peace!! Now that there is so much discussion on health care in the Windward Islands it is good to take a look back on how it was in former times. As for Saba, Dr. Robert Mol wrote a wonderful book entitled “Doctor on Saba”. Dr. Howard Cyril Tjon-Sie-Fat who was born in Paramaribo on July 6th 1911 and died there September 20th, 1984 also did an extensive study on the health care in the islands back in the forties. The latter worked for a number of years on Saba and St. Maarten and also married one of the Carty girls from St. Maarten. There are few sources which reflect the state of health care on Saba in the 18th century. Further research, including for example, an examination of ship’s logs, might shed further light on the subject. “There it is healthy, cool, and fresh, and the fresh and pleasant food is prepared with one’s own hands, one flourishes, despite the lack of care in which one lives there. So wrote the French priest Guillaume Th. F. Raynal, the “enlightened” abbe who in his Histoire Philosophique, popularized and copied a great deal of true information but also a great deal of nonsense from Denis Diderot, the celebrated writer of encyclopedias. Neither Diederot nor Raynal had ever been on Saba or even in the area. With these reservations I record Raynal’s citation, as it is the oldest description of the living situation of the people of Saba. Dr. Johan Hartog writes that, as far as it possible to ascertain, doctors and barber-surgeons were frequently present in the Windward Islands. Even Saba had its own barber-surgeon. In 1702, for example, Matthijs Koel from Monnikendam occupied this post. In 1790, Governor P.A. Godin wrote that the inhabitants of Saba were “strong, in general, and the women are beautiful,” but that almost always, scabies was common on the island. Almost all the inhabitants suffered from this disease. Sulfur, locally obtainable on Saba, was used as a remedy. The following is a fragment from the letter written by John Simmons, a resident of Saba to Governor P.A. Godin on St. Eustatius on March 24th, 1790: “That Mr. Robert Stovall Coopman, who lived on the island of St. Eustatius since the year 1700 and eighty until, in the month of May of 1700 and eighty eight he, feeling himself unwell, proceeded to the Island of Saba, staying in the house of the Suppliant, planning to stay until he was recovered and could return to this island, is deceased. That the Suppliant by the appropriate opportunity gave to the said Robert Stovall not only Lodgings, maintenance, washing, care, and freshening, but even gave him (as on Saba, is the custom, as there are no expert doctors or barbers on the island) simple medicines , made up by the Suppliant himself, so that, after making a happy recovery several times, the said Robert Stovall finally on the twenty-sixth of May of the year 1700 Eighty Eight, came to decease at the home of the Suppliant as a result of complete exhaustion of his life forces.” The letter reproduced here gives an indication, that at the end of the 18th century, health care was administered on Saba without the assistance of doctors or barber-surgeons. Somewhat more is known about medical care in the 19th century. Hartog writes that there were physicians on St. Euatatius and St. Maarten at most times during that century, as evidenced by the fact that a physician who also assisted private patients was assigned to the garrison. There was also a public health service of sorts. In 1830, the physician Philogene P. Maillard was assigned to it on St. Maarten. He by the way was married five times to daughters of prominent St. Maarten families. In about 1818 the Commander of the island of St. Maarten and Saba wrote in a report, “generally the air on these islands and in particular on Saba is very clean and the climate is healthier than on the other islands of the Antilles.” Further, Teenstra, who was not a physician, noted in 1834 that “epidemic illnesses are virtually unknown on Saba, which is attributed to the freshening sea winds. There is no Doctor of Medicine on the entire island. A very small amount of Leprosy is found here, and jaws and elephantiasis is totally unknown here. “The first case of leprosy was seen on Saba in 1840. It was most probably imported from St. Kitts. Because leprosy was also present on St. Eustatius, an institution known as Lazaretto was built at Diamond Rock in 1866. Patients from Saba were also cared for here. 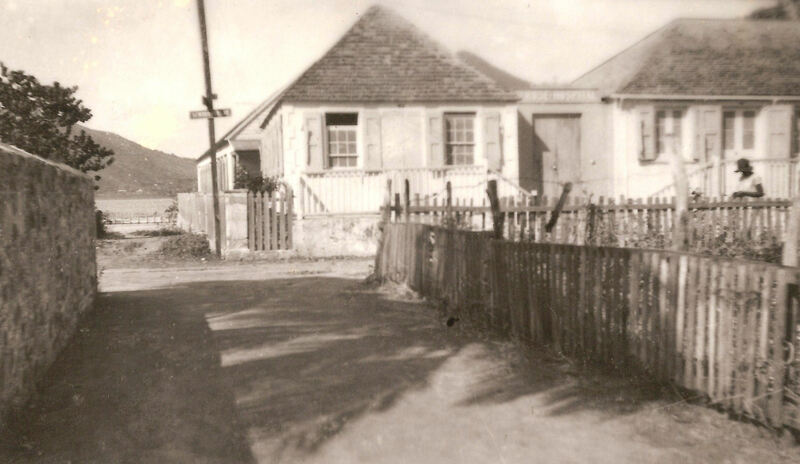 A previous leprosarium had been established as early as 1764 on a few small islands (“Five Islands” and “Hen and Chickens”) between St. Maarten and St. Barth’s. In 1863, physicians in the pay of the government were installed on each of the three Windward Islands. This measure was probably as a result of the abolition of the slave trade. The physician on St. Maarten H.E. van Rigersma, carried out studies in biology and, in particular, on mollusks in addition to his medical practice. A doctoral thesis had been written about this man. Also the well-known local journalist and author Josiah Charles Waymouth was married to his daughter. 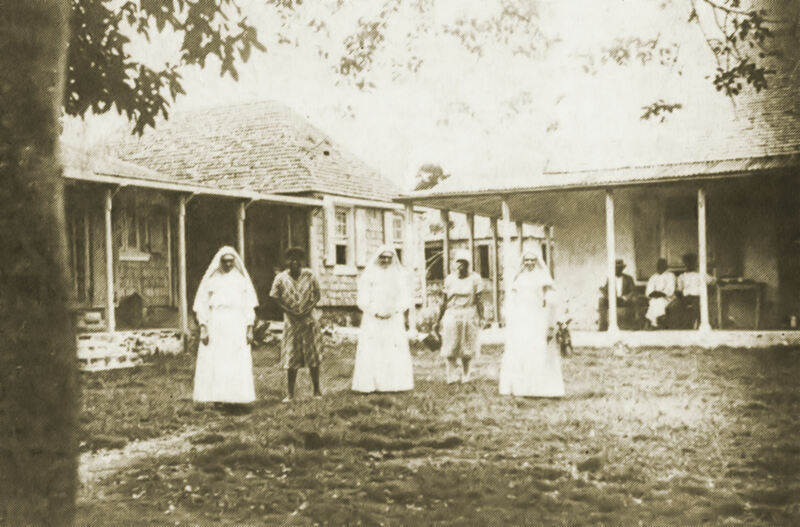 Mathias S. Voges also wrote a very informative book on the 100th anniversary of the Dominican Nuns of Voorschoten (1890-1990) in these Windward Islands which also gives a lot of information on their role in providing good health care to these islands. 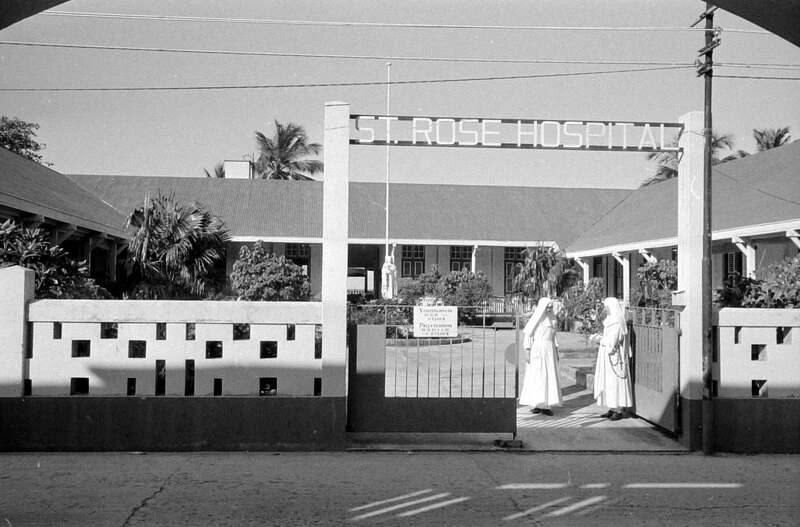 Since the nuns established their congregation on St. Maarten in 1890, it was their quiet wish, besides what they were already successfully doing in education to do the same for healthcare. In 1908 Father J.B.A. Gijlswijk together with Prioress Regina decided to start a hospital. Already in 1906 the nuns had come into the ownership of two houses on the Backstreet which had been willed to them by someone. The two houses were connected to each other and were put at the disposal of Dr. C.A. Shaw. This small hospital had a sickroom and operating room and a drugstore. All patients of Saba, St. Eustatius and St. Maarten irrespective of their religious beliefs were allowed the use of the hospital. One hundred years later the country is drained of resources with people from all three islands having to go to all over the world but especially to Colombia in search of health care. Neither one of the islands has a Medical Center modern and equipped enough to provide the medical service required for the three islands. Sister Agatha, who was a teacher by profession, was the first assistant nurse. She received instructions in preparing and serving medications and helped with operations and childbirth. She was assisted by some ladies in nursing and housekeeping. Installation costs were made possible by donations from residents on St. Maarten and through a fancy-fair and gifts from Holland. The amount collected was f. 2.715.—which was a sizable amount for 1908. In 1909 the government decided to give a subsidy of 25 cents per patient per day plans were made to expand the hospital. On January 2nd, 1910 a new wing was taken into use with a capacity of 18 beds. In August of 1916 the hospital got a new operating room and a deep cistern was built alongside the building. If I am not mistaken that cistern is still there. In the beginning things were tough but the Nuns carried on. In 1909 there was no government subsidy and the hospital dealt with 51 patients. By 1919 there were a total of 199 patients and the government subsidy was fls. 2.800,25 For that year. On June 14th, 1934 a start was made with the new hospital on the Front street by the company Albetam. This was opened on January 16th 1935 in a ceremony presided over by Mgr. P.I. Verriet in the presence of Lt. Governor and Mrs. Meiners, Dr. Ricoux from the French side, Dr. Hans Spitzer, Mother Vicar and the nuns and priests and many other prominent people from the island. 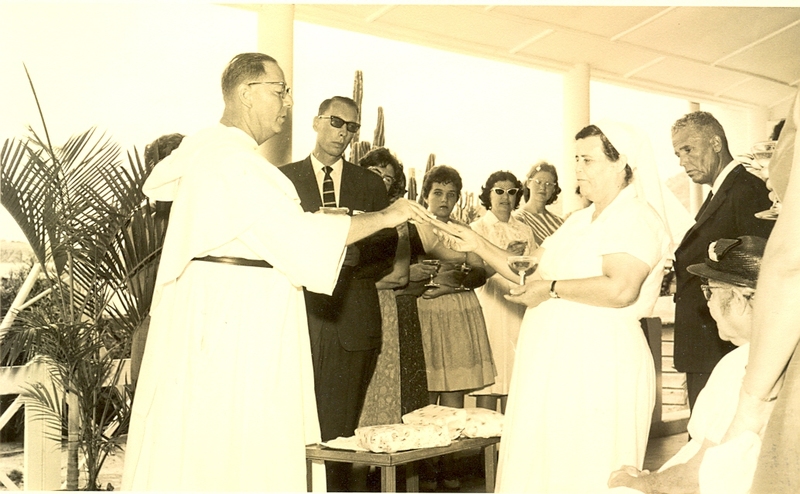 The golden jubilee of the St. Rose hospital was celebrated on November 9th, 1958 with a solemn Holy Mass of thanksgiving. The Mass was followed by the official reception whereby Lt. Governor Walter Buncamper, Commissioner Milton Peters, island council member’s, J.C. Larmonie and William B. Peterson, Dr. Tjon Sie Fat and his wife, priests from both sides of the island were all present. Lt. Governor Buncamper spoke words of appreciation for Father J.B.A. van Gijlswijk who had the vision to start a hospital on St. Maarten for the three Dutch Windward Islands. Mr. Lionel Conner in his speech brought alive the history of the hospital since it was started fifty years before. At the same time the jubilee was celebrated of Nurse Angele Cagan’s twentieth anniversary as a nurse in the hospital. She was widely praised for her love of the patients. She used to call me Kennedy. I was rooting for him for President. Nurse Angele was from Grand Case. She was a frequent visitor at Capt. Hodge’s guesthouse. Seems like I was the only one in the house for Kennedy. Nurse Angele would roll with the laugh when questioning me in front of Capt. Hodge and Miss Bertha with: “But why it is so that you like this Kennedy so much?” I think that secretly she was a Kennedy supporter herself. I remember coming up Front street the day he was murdered. She shouted out to me from the verandah of the hospital with “ Woo Kennedy, Kennedy dead.” And we went on to discuss the sad case in detail. I have fond and sad memories of the old St. Rose Hospital. Was in there twice myself , with the chicken pox, and the other time to cure some rum blossoms in my stomach. Dr. Levendag felt that I needed a rest in the hospital. My mother died there in 1977 and my father was dying in 1972 but the nurses worked on him and he was able to go home and die a few weeks later sitting under a tree watching his sheep. I have many wonderful memories of Frederick Froston, Angele Cagan, Nurse Ramona Illidge and Nurse Mavis Peterson. 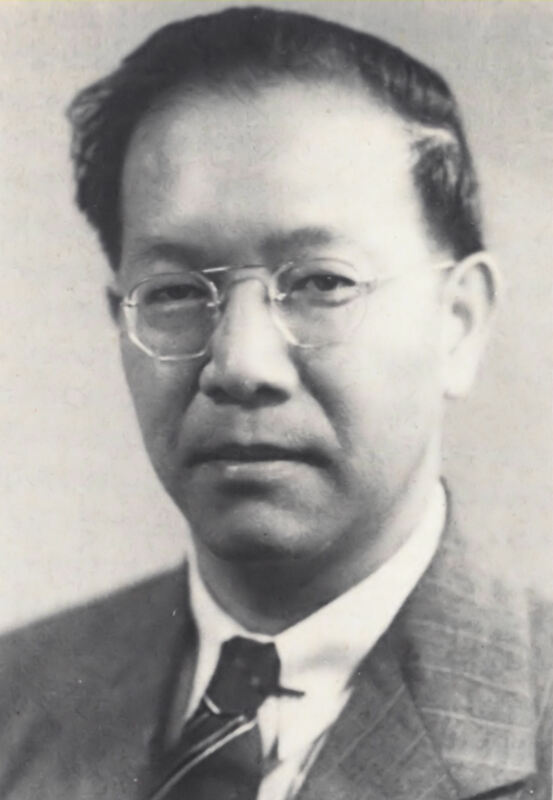 My mother was operated on for breast cancer there by Dr. Tjon Sie Fat in 1947 and went on to live until she died there in 1977. I remember going to see many patients from Saba and Statia and being helpful to them. It was this looking out for my people that later on got me elected on Saba. I remember going to see my old friend Commissioner Sadler of Statia. He told me a joke he planned to tell St. Peter when he saw him. Sadler was full of jokes. He looked so well that I walked back down to the Receivers Office where I worked feeling that Sadler would make it. A good half hour later the church bells started tolling. Someone, (I think Rosalie Carty) stuck her head in the office door and announced that a gentleman from Statia had just died in the hospital. I still cannot believe how quick he went and I hope that St. Peter liked the joke which Mr. Sadler had planned for him. At the end of 1990 the new Medical Center was completed and the important role that the Dominican Nuns from Holland had played in Health Care had come to an end. The Medical Center also played an important role for the surrounding islands. Now people are talking about Medical tourism seemingly at the expense of the Medical Center. I think that from Saba and Statia alone millions of dollars could be diverted from Guadeloupe and Colombia to St. Maarten and the people would be among friends and closer to home. I for one prefer to deal with the Medical Center and I hope that quick action can be taken to upgrade it and encourage people from the neighboring islands to choose that option in preference to Colombia and Guadeloupe. There is no time for further delay. Recently when doing research on their great grandfather Capt. Charles Barnes of Saba who moved to St. Barth’s, a box of old documents relating to the Dinzey family was found. The last Dinzey on St. Barth’s Julia willed her house to Capt. Barnes who had befriended her in her last years. Her father Sir Richard Dinzey son of Governor Thomas Dinzey of Saba played along with other Sabans a prominent role on St. Barth’s during the time that the island belonged to Sweden. The Sabans there were the largest slave owners on that island it turns out in documents which I recently had access to via Raymond Simmons. This small document was among the Dinzey papers which I am going through via Mr. Montoya who is married to one of Capt. Barnes’s great granddaughters. ” We the undersigned Burgers and Inhabitants of the island of St. Eustatius hereby certify and declare that this island was taken in possession by his Britannic Majesty’s forces in the month of April 1801 and held by them until the month of November 1802 when in consequence of the treaty of peace ratified at Amiens it was restored to the Dutch government. This document does not say so but the British reoccupied St. Eustatius later on and kept it until 1816 after which the island remained permanently Dutch. For I have heard good news from home. Has come across the deep blue sea. From friends I have not seen for years. Where I’ve spent years of joy before. My heart will be with those at home. Ethel Holm was born on Saba at Windwardside September 4th, 1901. Daughter of George William Christian Holm and Eldarena Hassell. She was a sister of Captains. Irvin and Ralph Holm. Jury selection began today in federal court in Fort Myers, Florida, where Hough, 67, is accused of using accounts at UBS AG (UBSN), the largest Swiss bank, and elsewhere to hide assets and income from the Internal Revenue Service, including almost $34 million she and her husband made when the schools were sold in 2007. The case is the largest, in dollar value, of four that have reached trial since the U.S. started a crackdown on offshore tax evasion in 2008. Prosecutors have secured 61 guilty pleas, including several involving larger accounts. Hough and her husband, David Fredrick, used the proceeds to buy an airplane, two houses in North Carolina, and a condominium in Sarasota, Florida, according to a May 15 indictment. Fredrick vanished after the indictment, leaving Hough to face trial alone. U.S. District Judge John Steele, who is overseeing the trial, has declared Fredrick a fugitive. Hough’s lawyers say she helped Fredrick build Saba University School of Medicine, on the island of Saba in the Netherlands Antilles, and the Medical University of the Americas, or MUA, on Nevis in the West Indies. Hough isn’t charged with stealing. Prosecutors accuse her of conspiring to defraud the IRS by using nominee entities to conceal assets and income. She’s also charged with filing false individual tax returns for 2005, 2006, 2007 and 2008 that understated income and didn’t disclose offshore accounts, according to the indictment. Hochman, who represented Fredrick for two years before his indictment, said his whereabouts are unknown. Prosecutors accuse Hough of scheming with her husband and two unindicted co-conspirators, Swiss financial adviser Beda Singenberger and UBS banker Dieter Luetolf. Singenberger, who was separately charged with helping 60 U.S. clients hide $184 million in offshore accounts, hasn’t responded in federal court in New York. Singenberger is one of 30 bankers, lawyers or advisers charged in the offshore crackdown. Prosecutors also accused 70 taxpayers of crimes, including at least six Singenberger clients who pleaded guilty. Luetolf isn’t charged. The Hough trial will focus on a web of accounts in Switzerland and Liechtenstein. At the heart of the case is whether she misused accounts associated with the Saba University School of Medicine Foundation. Defense lawyers said in a Sept. 27 filing that there isn’t sufficient evidence of Hough’s involvement with the accounts or her willful failure to disclose them. “It appears likely that the government’s purpose in indicting Dr. Hough was to exert leverage to secure a plea from” Fredrick, they said. Both Hough and Fredrick hold doctoral degrees and Hough earned a medical degree, according to Hochman and the indictment. Through the Saba foundation, which they first funded in 1988, according to a government trial brief filed Oct. 3, the couple opened the Saba University School of Medicine in 1993. Fredrick served as president and a foundation director. Hough was associate dean for clinical medicine. In 1999, Fredrick and Hough began the Medical University of the Americas, a for-profit school on Nevis in the West Indies, according to the government filing. Both the foundation and MUA failed to tell the IRS about accounts held at UBS, Liechtenstein Landesbank (LLB) and other banks, the U.S. charges. Singenberger and Luetolf helped the foundation and MUA move money through British Virgin Islands or Hong Kong entities they controlled called Top Fast Finance Ltd., Ample Dynamic Trading Ltd., New Vanguard Holdings Ltd. and Apex Consultants Ltd., according to prosecutors. “Hough and Fredrick were the beneficial owners of and had signatory authority over all over these accounts and owned and controlled each of them,” prosecutors said in their brief. Equinox Capital, a private-equity firm based in Greenwich, Connecticut, bought the Saba school and MUA for $36 million in 2007. The transaction included $34 million for land held in the name of Fredrick’s daughter from an earlier marriage, according to prosecutors. Hough and Fredrick didn’t tell the IRS about most of the proceeds of the sale and transferred money among various undeclared accounts to buy the plane and real estate, make gifts to family members and pay personal expenses, prosecutors said. In July 2005, Fredrick and Hough caused UBS to transfer $1.14 million from the New Vanguard account to buy a house in Asheville, North Carolina, according to the indictment. They then caused Lynn, Leon & Lyon Group LLC, a Florida company they owned, to buy the house. They transferred the deed three years later to Top Fast for $1.5 million, prosecutors said. Defense lawyers countered that Hough didn’t direct a single transaction from any offshore account. She “repeatedly told her accountants that she wanted to do whatever was required to be fully compliant with her tax obligations,” they said in the Sept. 27 filing. If Fredrick used foundation funds for personal expenses, she understood they were authorized by that organization’s board and offset his “substantial deferred compensation,” according to the filing. Hough grew up in housing projects in Youngstown, Ohio, according to Hochman. She attended Phillips University in Enid, Oklahoma, on a scholarship, before earning a master’s degree of social work and a doctorate in sociology. She earned a medical degree at Ross University School of Medicine on the Island of Dominica, where she met Fredrick. They wed in 1984. She became a board-certified psychiatrist and practiced in Georgia, Massachusetts and Florida. At the medical schools in Saba and Nevis, she focused on arranging clinical rotations for third- and fourth-year students, according to Hochman. More than 1,500 physicians have earned medical degrees at Saba, and its program has approvals from licensing boards in New York, California and Florida, according to the Equinox website. MUA has awarded 500 medical degrees, according to Equinox, and its program has approval from the New York licensing board. Equinox also owns St. Matthew’s University in Grand Cayman. Students at Saba University School of Medicine could begin receiving federal loans in August, according to the Education Department. Previously, students borrowing for school would have to rely on private debt. Since 2009, Hough has worked for the Florida Department of Health in Sarasota. She makes $60 an hour working part-time seeing patients with behavioral health problems, according to Courtney Gager, a health department spokeswoman. Hough lives in Englewood, Florida, according to prosecutors. If convicted, Hough faces five years in prison on the conspiracy count and three years on the false-returns counts. The case is U.S. v. Fredrick, 13-cr-00072, U.S. District Court, Middle District of Florida (Fort Myers).